Redemption Church seeks to be a faithful church of Jesus Christ, devoted to making, maturing and multiplying disciples. Loving God; Loving One Another; Sharing the Gospel. We believe God created us to know, enjoy and glorify him forever (Revelation 4:11). Nevertheless, mankind selfishly rebelled against God’s kingship and glory. But God, in his marvellous grace, sent his Son, Jesus Christ, into the world in order to redeem us from the power and guilt of sin. Therefore, as those redeemed and restored in Jesus Christ we seek to do everything to the praise and glory of our creating and redeeming God (Ephesians 1). We believe the good news of redemption from sin in Jesus Christ is central to everything we are as a local church, both in our corporate worship and weekly activities (Ephesians 1:7). The gospel of grace is non-negotiable (Galatians 1:6-9). Therefore, in everything, we constantly seek to grow towards a deeper understanding and experience of this only gospel (2 Peter 3:18). We believe that the sixteenth century Protestant Reformation rediscovered the gospel of grace. We stand united with Christians who recognize that we are saved by grace alone, in Jesus Christ alone, by grace alone, through faith alone, to God alone be the glory. As part of this Reformed identity we submit to the teachings of Scripture alone. These doctrines of Scripture are summarized in the ecumenical creeds, and our confessional standards: the Belgic Confession, the Heidelberg Catechism, and the Canons of Dort. We believe that through His Word and Spirit, Christ creates a new community living together in love (John 13: 34-35; 1 John 4: 7-21) and in unity of faith (Ephesians 2: 1118). This community reveals the mystery of the gospel and the wisdom of God (Ephesians 3: 6, 10) as diverse individuals (socio-economic, ethnic etc) form deep gospel centric relationships. Therefore, we intentionally seek to be a church that reflects the great love of Christ (Galatians 3: 28; 1 Corinthians 13). We believe that Christ commissioned the church with the task of making, maturing, and multiplying disciples among the nations. Therefore, we aim to preach, teach, and witness to the good news of Jesus Christ through the power of the Holy Spirit, first among ourselves, and then through the communities in which God has placed us. We believe the promise of the gospel is for believers and their children (Genesis 17; Psalm 78:1-4; Acts 2:39; Ephesians 6:1-4). Therefore, we are committed to instructing the next generation about our glorious salvation and helping equip each member to discern and use their God given gifts for the growth and health of the local church (1 Corinthians 12; Romans 12:4-8). We believe that Christ calls the church to be a light in the world (Matthew 5: 14-16). Therefore, we value the proclamation of the gospel for the lost throughout the world; we also seek the welfare of our local community (Jeremiah 29:7) through active involvement. Pastor Jake was born in Ontario, but grew up on the West Coast of British Columbia. While working fulltime at an equestrian show facility he eventually earned a Bachelor of Art degree in History at the University of the Fraser Valley. In 2016 he graduated with a Master of Divinity degree from the Canadian Reformed Theological Seminary in Hamilton, Ontario. 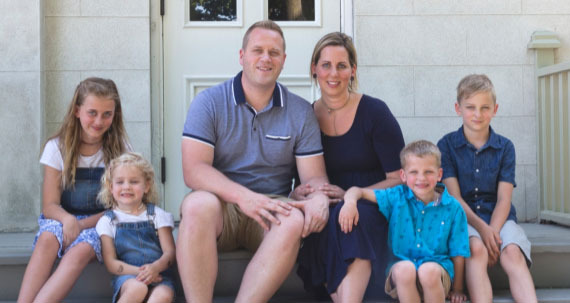 That same year he entered full time pastoral ministry at Redemption Church, a place where he's excited to see how the gospel of grace is tranforming the lives of individuals and their communities. Since 2006 Pastor Jake has been happily married to his beautiful wife, Marietta. Together they have four wonderful children, who keep them moving and on their toes. In his free time Pastor Jake can usually be found hanging with the family and exploring the sights and attractions of the local area.